From the Warp: What, no model for your must have unit? What, no model for your must have unit? 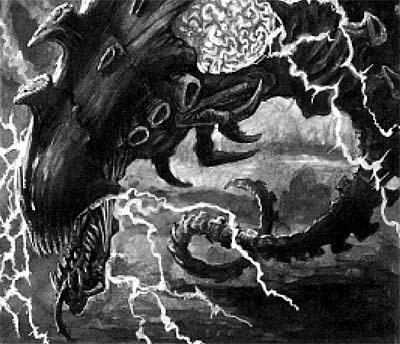 Have you seen that recently GW has started to deliver unit definitions on Codices that were not available in some form in the Citadel catalog? It's been like that for years, but wasn't that evident until the recent release of the Blood angels codex where the Storm Raven was defined in the Codex, but no model was even hinted at... not even a drawing could be found. This has left some gamers crying foul over a perceived lack of support from Games Workshop. Before, a gamer could find inspiration in a drawing to make ends meet, now they may be feeling like GW has left them all on their own to figure it out. But I think there are two things things here that need to be looked at. 1. Speeding up the Codex creation process. Since GW doesn’t have to stretch resources to produce every option in the codex, they can put them out faster. 2. Stimulate the hobby, for those who enjoy the aspect, having the option of designing our own models is something we can appreciate. We all love to have more codices released per year, especially if your Codex is still from third edition and some options really need adjustments. Being able to stimulate the hobby and get new books out quicker also helps GW too. With that in mind, we as gamers (and modelers), have a few options. 1. Not use the unit. This is the simple way out, but not something you may be willing to do. You might be missing out on a worthy addition to your army. 2. You can proxy the unit. This is maybe the easier choice, you simply grab a toy or model to represent the unit and keep gaming. This way, you don’t miss the thrill of fielding the unit and this will help you determine if you want to add the unit to your army before you spend the time converting or scratchbuilding. The downside to this is that you may run into problems with proxied units. 3. 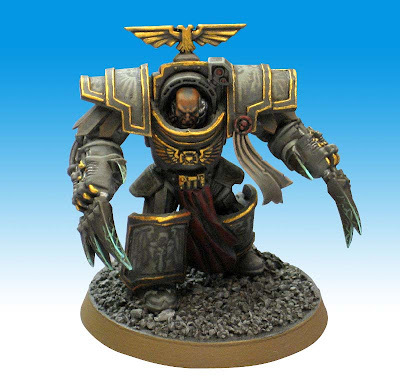 You can purchase a proxy model form another company like Dragon Forge, Forge World or any others out there that exist to fill the many specific needs of gamers. With a little looking around, you can find some great models. 4. Kit-bashing. This is my preferred approach and one that almost every gamer or modeler with a bit of experience has done (even in small quantities). Once you start kit-bashing, a whole new world of modeling possibilities opens up. Before you know it, you're scratchbuilding entire models. 5. Scratch building, the Holy Grail of modeling. For the modeler that not only wants to have a nice little army, but also wants something that sets apart from the rest of the armies out there. This is the most difficult of the options, but once you start doing it, it can be the most rewarding of all. You can look in the web for great examples like Dave Taylor, Del Greci, and many other talented modelers that simply lost the fear and started to cut plastic or shape green stuff with an goal in mind, and that didn’t feel discouraged when something didn’t go as expected. If you try your best and don’t despair your awful model today could end up being the basis for your incredible model of tomorrow. I’m Werner Oroxón, from Warhammer 40k Miniatures Guatemala and I hope my not so few words have opened your options about what to do when you don’t have a certain model. Games Workshop announced a while back that they fully intended to include units in the new army lists that had not been designed yet, so that new model releases for each faction would continue after the initial launch of the codex and the design studio wouldnt be rushed or hindered by a codex release date. prime example of this is the Ironclad dreadnought.... GW can be accused of many things, but a lack of support for the main 3 game system isn't one of them. I think for any of us old Rogue Trader players the idea of making your own is a good slice of what the hobby is about. This practice has been around for a long time. Many companies stagger their releases. Problem with GW is that they don't always come through. Belial is a perfect example. Recently, GW has been stepping up to the plate, and trying to be more concerned with all areas of their product (gamers, hobbyists, tournaments, etc) and so I'm willing to give them the benefit of the doubt in 5th edition, something I would not have done in the past. they could've at least made an illustration to help guide converters. I've seen some pretty ludicrous models of the stormraven floating about. Let's not forget that the Ork Stompa model had been originally planned to be released with Apocalypse. Sometimes the model's production phase can suffer a setback - it would be foolish to let that slow down a book release. That's why the Stormraven has no picture - whatever they wanted it to look like couldn't be molded for whatever reason. Rather than tie themselves down to a certain design that might not work out they leave you hanging so they can get it done by the time the GK's are out. And how many extra Canis Wolfbourne models do you think they sold due to a lack of Thunderwolf analouges.